This project organizes platforms for scientists and policymakers to exchange climate information and create better policies to build climate-smart food systems in West Africa. CCAFS. 2015. 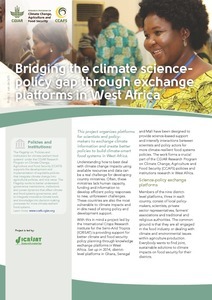 Bridging the climate science-policy gap through exchange platforms in West Africa. Project Flyer. Copenhagen, Denmark: CGIAR Research Program on Climate Change, Agriculture and Food Security (CCAFS).